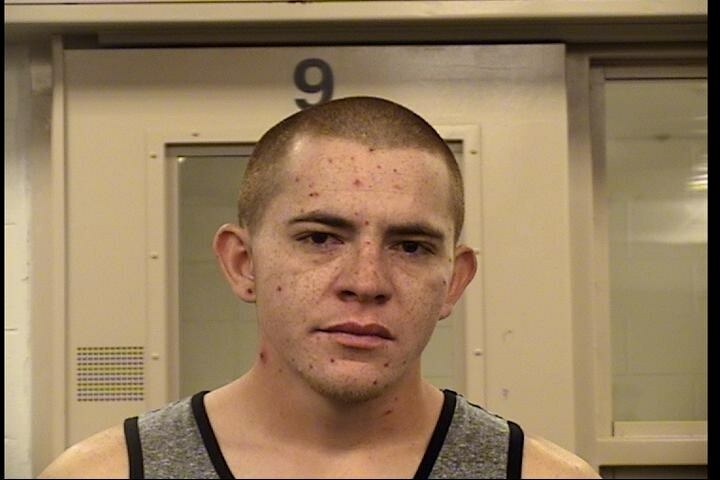 Joshua Ortega, 22, was observed in a stolen vehicle, ran from police and put the public in extreme danger by his selfish acts of violence. Jonathan Midyette, 25, was arrested and charged with Receiving/Transferring a Stolen Vehicle. This morning at about 8:00 a.m., an Albuquerque Police Department undercover Impact detective was on his way into work. He spotted a suspicious gray Mitsubishi that was occupied by two Hispanic males in the Costco parking lot located in the 9500 block of Coors Blvd. The detective knew this area was being targeted lately for auto burglaries and saw this vehicle driving back and forth in the parking lot. The detective ran the license plate on this vehicle and discovered the vehicle was reported as a stolen vehicle. The detective called for other detectives to back him as the vehicle left the area. Detectives followed this vehicle in an attempt to apprehend them by surprise. The vehicle stopped in the area of Irving and Eagle Ranch to let the passenger out. The passenger walked away from the stolen vehicle and attempted to enter a yellow van. This male was taken into custody and was identified as Jonathan Midyette. You may recognize this name due to Midyette was just arrested February 9th, 2017 for selling drugs out of his yellow van at the skate park located near Coors Blvd and Ellison Dr. The driver in the vehicle, later identified by Midyette as Joshua Ortega, drove away from the area unknowing of Midyette's arrest. All marked units were told not to follow Ortega and detectives continued to track his movements. As the vehicle approached Coors and Hanover a plan was executed to spike belt the vehicle which was successful at deflating 3 tires on the car. This was done in an attempt to stop Ortega, however he continued to drive on flat tires for a short time before he fled on foot. Prior to officers being able to apprehend him, Ortega located a female with her infant baby. He threw both of them to the ground and stole her vehicle. Both mom and baby are expected to be okay. Due to officers observing his aggressive driving during rush hours traffic as he fled the area, the decision was made not to pursue Ortega. This was made to keep the community safe since we now knew who he was. Detectives have a warrant for Ortega's arrest for Unlawful Taking a Motor Vehicle, Child Abuse, Robbery, and Aggravated Fleeing. The decisions the officers and detectives made to not pursue Ortega were in the best interest of public safety. We will catch Oretga and he will be arrested. The officers and detectives did an excellent job getting Midyette into custody and identifying Oretga. Both Ortega and Midyette have a criminal past and both have very recent arrests just this year. If anyone knows where Oretga is we ask that you call Crime Stoppers at 843-STOP.